FISTS CW Club - Promoting Morse Code for over 25 Years. Please consider joining and supporting this very popular CW Club. Airlink Express is a compact piece of software designed for Rx/Tx of PSK and RTTY. 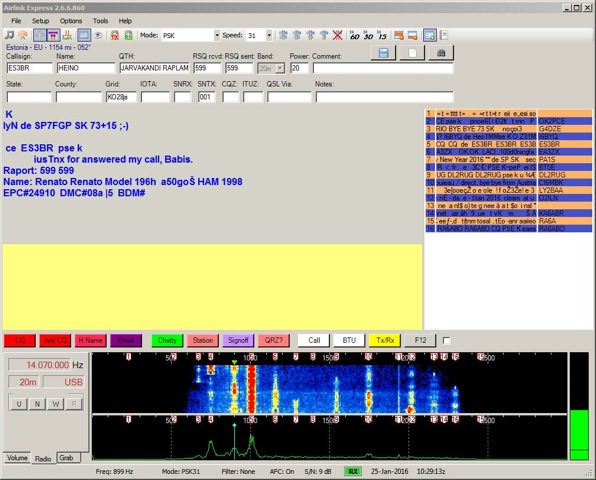 I downloaded it last year but never really got to use it much - written by KR1ST, I believe the code from the original Digipan was re-worked resulting in a much more flexible tool for decoding PSK/RTTY (certainly more colourful). Having never previously used it I thought it might be useful familiarising myself with it and posting my thoughts here. I used my TS590S for the tests and under setup/audio, and radio soon had it displaying stations on the waterfall, (NOTE - Using USB connection - so no interfacing needed) and showing the correct band and frequency. One of the useful features of many psk programs is the ability to quickly grab callsign data to fill the log fields and Airlink does this efficiently with a double click of a callsign in the reception window, (once you have set up the QRZ.Com lookup section) it will instantly fill most of the required log fields - saving a lot of clicking and time wasting. The waterfall and spectrum display is at the bottom of the screen and I usually set my radio's initial bandwidth to 1500Hz, then once having found a station to call usually invoke a narrow filter which greatly helps suppressing adjacent signals and improves the decoding. DON'T fall into the trap of using continually repetitive messages by the use of macro's - so so many times I see on screen many stations conducting the same QSO's using the very same macro's over and over - you need to type at least "some" live text into your QSO to give the other station (and listening stations) the impression that you are actually sitting at the keyboard, and that they are not talking to a Robot ! QSO's can be conducted wholly from macro's, but careful choice of wording will help make it sound real, and not repetitive - make a point of changing your macros often, especially personal and station details. Macros follow the usual (Right click on the Macro button) to bring up an editor in which you can easily change the macro contents, button colours, and it's title etc... this is straight forward. 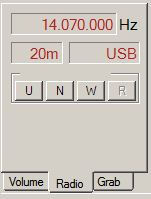 There are two sets of x12 macros - the second set is activated by checking the box to the right of the last macro and using the shift-F1 F2 F3 etc... once set up you can create macros for psk / rtty / or contesting and save them for future use, or however you use them. The bottom left hand corner has a box displaying tags for Volume, Radio, Grab - these are for direct control of the volume input, your radio's band/frequency, and Grab - where heard callsigns can be collected - this a live thing where if you see a callsign you wish to call you can double click and go the the exact channel, this can also be achieved by clicking a "Super Browser" which lists up to 16 stations being monitored simultaneously (PSK) or 4 RTTY stations. Program customisation is a breeze under the options tab - colours can be re-selected to your own spec (whatever takes your fancy) there are selections for band configuration, FSK serial port setup, Audio, various others - you can send data included in a file if you wish, (I have actually worked a certain Italian station and he regularly gives his life story which MUST be in a file) Hi... Takes an age to complete Yawn...! (Worse than macro's). Great little piece of Software - pity it's not on Linux, though it might run under the influence of "Wine" (Spanish of course)! Google it - Download it - Give it a try.